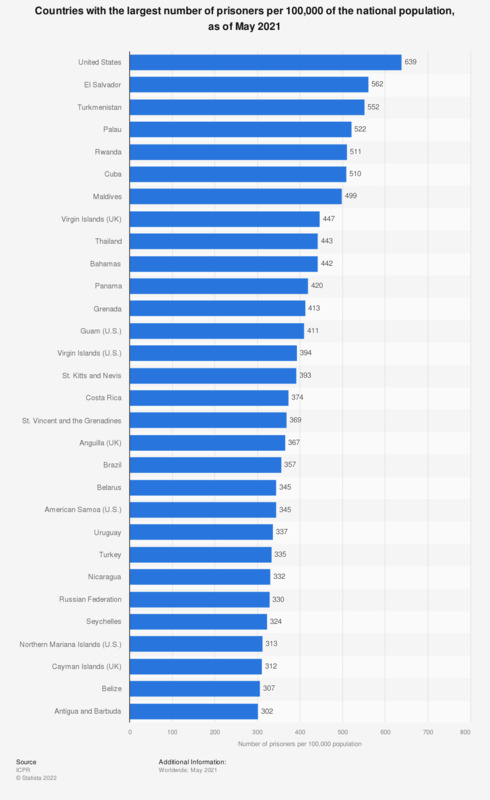 This statistic represents the countries with the most prisoners per 100,000 inhabitants, as of July 19, 2018. The United States had the highest prisoner rate, with 655 prisoners per 100,000 of the national population. As the statistic above illustrates, the United States has one of the highest rates of incarceration in the world. With 655 inmates per 100 thousand of population, the U.S. is by far the leader among large industrialized nations in incarceration. Russia comes closest at 451, though there is no data regarding China’s incarceration rate available. Not only is the U.S. among the leading countries worldwide in incarcerations per 100 thousand of population, but it was also home to the largest total number of prisoners in 2014. Roughly 2.2 million people were incarcerated in the United States in 2014. China’s estimated prison population totaled to 1.7 million people that year. Other nations with population sizes comparable to the United States have far fewer prisoners. The majority of U.S. prisoners in federal correctional facilities were of black or African-American origin. As of 2011, there were about half a million male and about 26 thousand female black, non-Hispanic prisoners. They made up 40 percent of all incarcerated persons in the U.S, but accounted for only 13 percent of the total U.S. population. About 237 thousand prisoners in state facilities were sentenced for drug-related offenses, accounting for roughly 17.4 percent of all state prisoners in the U.S. Drug-related offenses, such as trafficking and possession, were the most common cause of imprisonment in state prisons. Second most common were felonies, such as robbery and murder, at 13.6 and 12.2 percent respectively. The source does not provide a release date. The date given here is the date of access. Everything On "Prison system in Singapore" in One Document: Edited and Divided into Handy Chapters. Including Detailed References.